Our new Consultant Invoice works well as an IT consultant invoice template because it uses separate sections for hourly charges and other fees, such as equipment or parts or setup fees. It uses our new Bold and Light themes, and you'll find both of these themes included in the one download. If you prefer the classic theme used by our original free invoice template, let us know and we'll consider making that available for the consultancy invoice as well. This consulting invoice template is set up to allow you to record both hourly charges and charges for fees, parts, and equipment. It was design specifically for an IT consulting service, though it is general enough to be used by almost any consultancy business. - If you are really on a budget, you can save ink costs by using the "Light" theme shown above. The "Bold" theme shown on the right is included within the download also. - If you don't like the orange color, all you need to do is go to Page Layout > Themes > Colors to change the theme color. - Different states have different laws regarding taxes, such as whether or not labor charges are taxed, so you can enter different tax rates for the "Hourly Services" and "Other Services" sections. 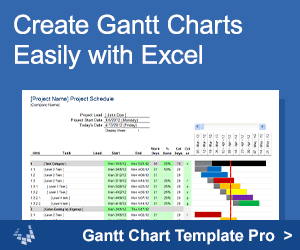 - Consultants often do work based on a Work Order or Purchase Order, so there is a place in the header of the template for recording that number. 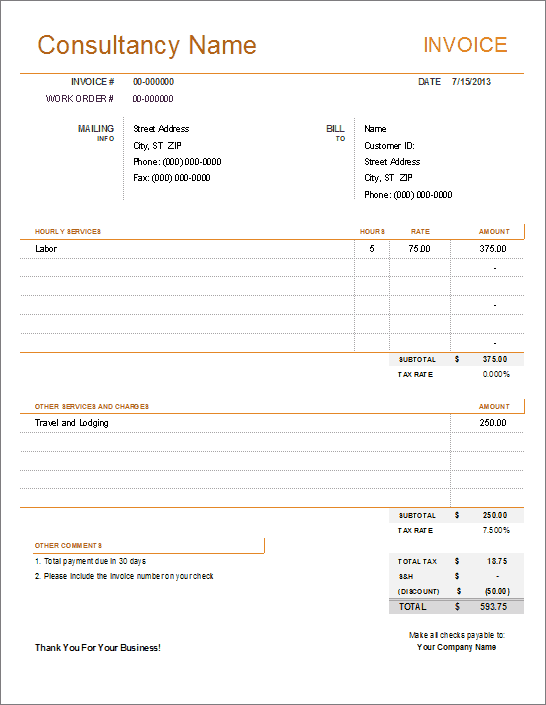 - You can use this invoice to provide your client a quote by making a few minor adjustments to the template. Change the "INVOICE" label at the top to "QUOTE" and modify the comments area to include text like you'll see in our Quote Template. 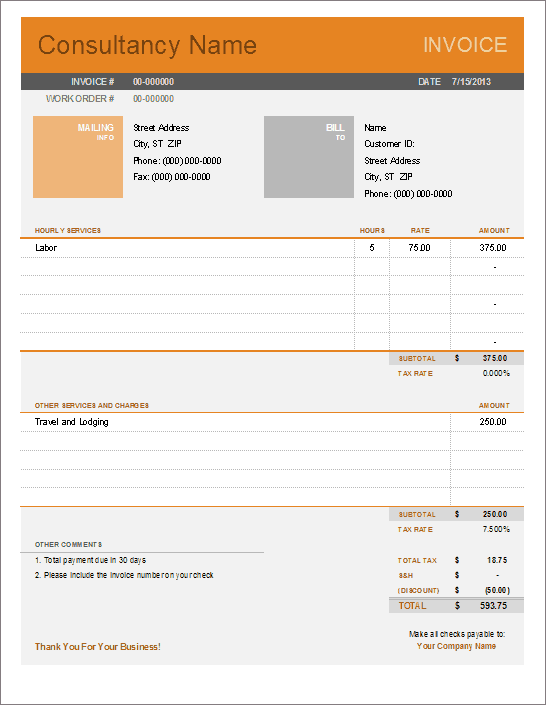 Also change the "Invoice #" label to "Quote #" and change the "Date" label to "Valid Until".